Hamburgers are an American tradition of summer-time grilling or anytime of the year. Making a perfect shaped hamburger is a key to your eating enjoyment. If the hamburger patty is too thin, it may burn or be over cooked and if it is too thick or unevenly made, the cooking will be uneven; it may be cooked well on one side, but still raw on the other side. You can spend a lot of time cutting, forming and pounding hamburger meat into patties, trying to round the edges with your hands to form perfectly round patties. Then they get mushed when you scrape them off the cutting board. make a perfect shaped hamburger every time with no fuss and no muss. I was recently contacted by the good folks at Cave Tools to try their Burger Press. This an easy gadget any griller or home cook can use to make a perfect shaped hamburger every time, and it makes the grill marks, so you get perfect looking burger, whether you cooked it on a barbecue, stovetop grill or in the oven. How to Get a 15% Discount Now! Cave Tools is offering my readers a 15% discount on the purchase of a Burger Press. Just enter Burger15 at the time of purchase. Cave Tools was started by Michael “Medium Rare” O’Donnell, back in 2013 with the goal of creating superior and affordable barbecue and cooking tools backed by the best customer service in the industry. Create high quality barbecue and cooking tools that lasted for years. Offer boutique-style customer service from real people. Provide more value than our competitors by going above and beyond for our customers. The Cave Tools Burger Press is constructed from aluminum, not plastic, so you will get years of use from your burger press. The aluminum will not rust, so you can either hand wash or put in the dish washer. The Burger Press, which is made from sold aluminum and not plastic, is super easy to assemble. Simply screw the handle into the top piece of the burger press and you’re ready to go! I recommend washing your new Cave Tools Burger Press in warm soapy water before the first use. Burger Press and making a mess trying to pull the burger off, you get a stack of wax paper squares with your purchase. Simply place a liner on the bottom of the press, the place your hamburger meat, ground turkey or even ground chicken into the center. Place another wax paper square on top, then simply place the top burger press on and press the meat in to a perfectly formed and shaped burger, that includes grill marks. Now, just lift the wax paper out and you have perfect hamburger patties ready for the grill with no mess, or you can stack the burgers with the wax paper on them. You can place the patties with the wax paper in a ziplock bag, and store in the freeze for later use. CUT PREPARATION TIME IN HALF – Spend more time eating with your family and less time in the kitchen. BURGERS COOK EVENLY – Use indicator line to make burgers with consistent size and shape. FEED THE WHOLE FAMILY – Palm shaped handle reduces fatigue when pressing multiple burgers. INCLUDES 200 NON STICK PATTY PAPERS. DISHWASHER SAFE – Cleanup is a breeze. The top piece fits nicely into the bottom. Perfect for easy storage. You can see the raised marks to create hamburgers with grill marks, whether you cook the burgers on the barbecue, stove top grill or in the oven. Just place a wax paper square, which comes with your Cave Tools Burger Press, into the bottom piece. 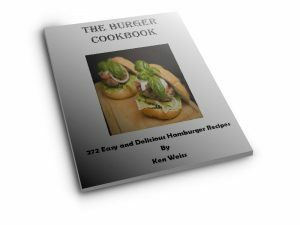 Make 1/3 or 1/4 Lb hamburgers into round balls and place into the burger press. Press the top piece down into the bottom piece, and the meat fills in the press to form perfectly round 1/3 or 1/4 Lb burgers with grill marks. With the Cave Tools Burger Press, you can make perfect burgers by pressing the meat in to the press. If you find the meat is sticking to the top piece, just use a wax paper square on the top of the burger, then the meat will not stick, and will also make your burger press easier to clean. The Cave Tools Burger Press is easy to clean. It is 100% dishwasher safe. You can also hand wash. Enter Burger15 at the time of purchase to get a 15% discount on the purchase of a Burger Press.